Detroit - Right up until the end, John Dingell wouldn’t go down without a fight — or a tweet. The longest-serving member of Congress in American history, who died on Thursday at age 92, boasted more than 250,000 followers on the account he started in 2010. After his wife, current Rep. Debbie Dingell, tweeted Wednesday — the day before he died — that she was home with him and they had “entered a new phase” as he was receiving hospice care, news stories proliferated. Well wishes poured in. John Dingell even gained about 4,000 followers over the course of the day. Still, he said in a tweet later Wednesday that he was grateful, but not giving up. 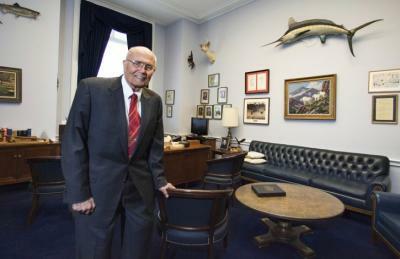 Dingell, who announced in early 2014 that he would not run for a 30th full term representing a district covering some of Detroit’s suburbs and the Ann Arbor area, was long known for his wry takes and quick wit alongside his mastery of legislative deal-making. But the outspoken Democrat’s social media musings — let alone presence on the platform — drew widespread interest and kept him au courant. “Buddy, I think you might want to sit this one out,” came a tweet by Dingell on Feb. 2 that was addressed to President Donald Trump. The commander in chief said the man who ran against Virginia Gov. Ralph Northam should “be thinking Malpractice and Dereliction of Duty with regard to his Opposition Research Staff” after the revelation that a photo of two men in blackface and KKK costumes was put on Northam’s medical school yearbook page back in 1984. Dingell never held his fire or ire for Trump on Twitter, referring to him last month as “idiot president” and “crook” in tweets about the partial government shutdown. Earlier, he called the president, no slouch at name-calling, a “damned two-bit grafter” and has lobbed many other sobriquets more colorful and profane. It doesn’t appear that Donald Trump has ever tweeted about Dingell. Tweets also were common about sports, particularly Dingell’s beloved Detroit pro teams and the University of Michigan, and he often punctuated posts about the latter with #Hail and #GoBlue. Recognizing the reality of Detroit’s perennially struggling pro football team, he tweeted “Lions gonna Lion” on Sept. 30, the day his team lost 26-24 to the Dallas Cowboys. A week earlier, he tweeted, “God grant me the strength to make it through this Lions game without incident” on the day the lowly Lions actually beat the eventual Super Bowl-winning New England Patriots. Former Ohio Gov. John Kasich, who served in Congress on the other side of the aisle from Dingell, was among his Twitter followers. Kasich, who spoke to The Associated Press after reports that Dingell was in hospice but before his death, recalled the Democrat’s power and toughness as well as his kindness and collegiality — traits that transferred well to Twitter.